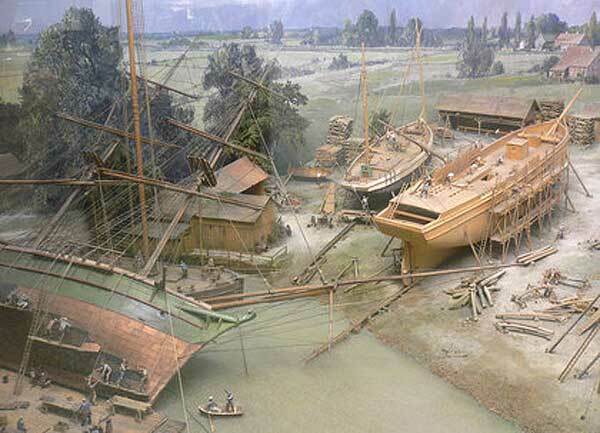 Pirates & Privateers : How was the construction of pirate boats made? My 8 year-old son must answer this question quite explicitly. Thank you very much. Question of Josy Vermette (11.20.2015): How was the construction of pirate boats made? My 8 year-old son must answer this question quite explicitly. Thank you very much. In reality the pirates plundered ships (typically merchants) and seized them. The construction of a ship was made in a place called shipyard. It was first necessary to arrange the keel which was the backbone of the vessel. Then they built the skeleton around the keel. Then they assembled couples of ribs and the U-shaped end climbing up the stem which was the large piece of wood that closed the front of the boat (the bow). Then they constructed the outer bend giving shape to the boat, to which an inner skin (called planking) and an outer skin (called curling) was added. To put up the different decks of the ship there was a need for support leases. They were cut into the sides of the square gun port for cannons. Once the ship was built, it was put in water and the masts were put up last. This step was very difficult because the hull could be pierced by masts and sink the ship if mishandled.